What a jam-packed year this has been! We had no idea what God had in store for us this time last year. Harrison and Grant have brought so much joy to our lives since they were born in July! The Lord helped us to accomplish drilling a new well and replacing the roof on the church! We also have done more ministry and made better connections in the villages this year and are excited to see what the Lord will do in 2017! We’ve been praying for a way to bring the congregation together outside of the church setting. We felt the Lord leading us to start “CONNECT”. This is what we are calling our small group home meetings. 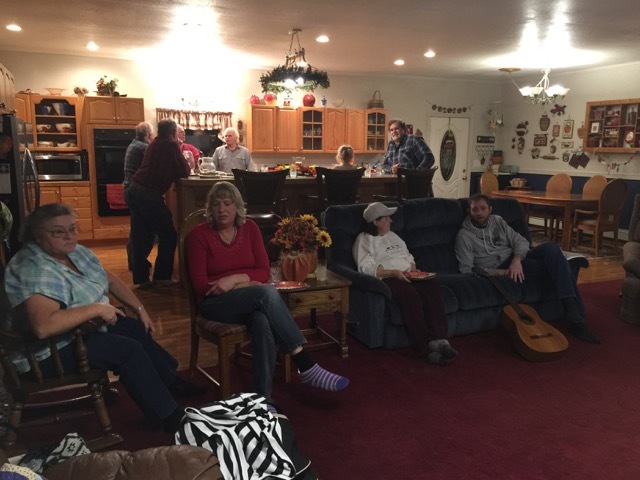 We had our first meeting and had 19 in our home. We've had several meetings since then and the attendance has grown. It's a fun night of food, games, and a small devotion. The focus is simply building relationships! Relationships are key to letting people know that they are wanted, loved, and have a purpose! In November, we were able to help several families with Thanksgiving baskets! Bro. Randy Perry from Oklahoma sent an offering to cover the expenses for this project. What a blessing it was to visit with these families and pray with them. It was a joy to visit the nursing home and the shut ins around town during the Christmas season! We passed out small gift bags as we sang Christmas carols and encouraged those around our community with the message of our Saviour's birth. On Christmas morning we had a candlelight communion service. There were eleven visitors in attendance. Two received Jesus that morning and we are rejoicing with them! One was a woman in her seventies who was raised Catholic. She had not been to church in many years. She testified of making a new commitment to Jesus. She didn't have a Bible, so we gave her one. Praise the Lord for what He has done!! We are so grateful and humbled by your sacrificial giving towards the work we are doing here. We ask that you continue to hold our family up in prayer that 2017 would be our best year of ministry in Alaska!